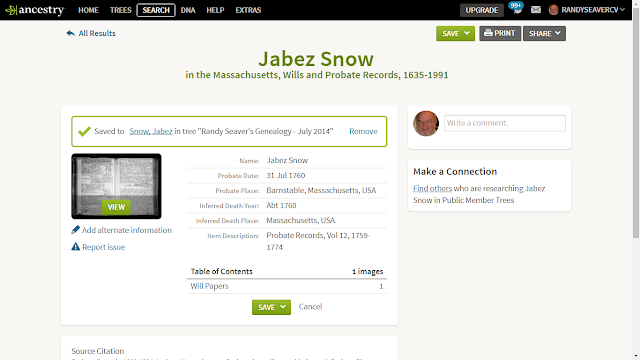 Jabez Snow (1696-1760) is #286 on my Ahnentafel List, my 6th great-grandfather, who married #287 Elizabeth Paine (1702-1772) in 1720 in Eastham, Massachusetts. * their daughter, #143 Eunice Snow (1722-1816) who married #142 Nathaniel Horton (1721-1771) in 1742. "Dea. 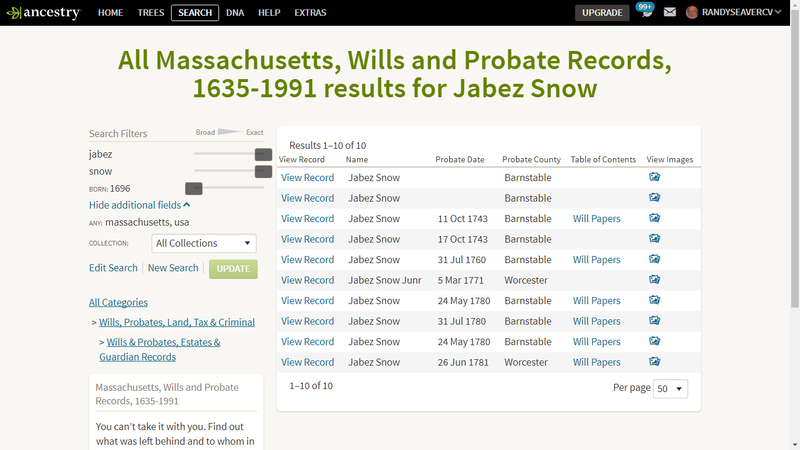 Jabez Snow (Elizabeth Treat, Samuel, Robert, Richard), born July 22, 1696, in Eastham, Mass. ; died Sept. 6, 1760, in Eastham; married Oct. 27, 1720, Elizabweth Paine, born June 2, 1702; died July 6, 1772, and daughter of John and Bennet (Freeman) Paine. Mr. Snow was a prominent man in Eastham, and a deacon in the church. He was selectman in 1743 and 1744, and town clerk in 1759 and 1760. His will is dated July 31, 1760; probated March 17, 1761; inventory, May 9, 1761, £254 0s. 4d. Mentions wife Elizabeth and his six children. Son Jabez was executor, who applied to the General Court, June 24, 1761, and obtained permission to sell the property of the estate, which was insolvent, and to appropriate the proceeds, after paying the widow's thirds, towards paying his deceased father's just debts." Jabez Snow was born 22 July 1696 in Eastham, Massachusetts, the first child of Jabez and Elizabeth (Treat) Snow[1-4]. He married Elizabeth Paine on 27 October 1720 in Eastham[1,4-6]. They had six children between 1722 and 1740. "I Give and bequeath unto my three Sons Namely Jabez Snow Silv^s Snow and Sam^ll Snow and to their heirs and Assigns forever all my Lands & Meadows and Real Estate Whatsoever to them in Equal Proportion in Equal Proportion Allike that is to Say two thirds thereof Next after my Decease & all the Remaining part next after my Said wife Elisabeth Snow Shall ^cease^ to have the Improvement thereof as above Expressed in this my Will & at the times above Expressed." 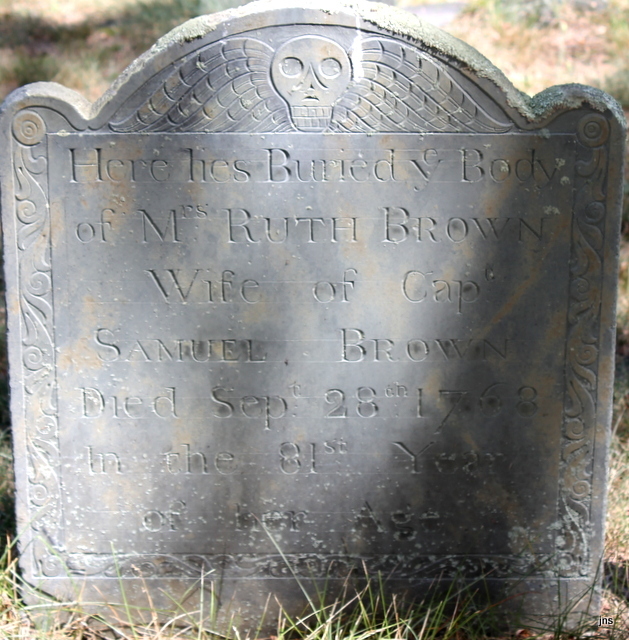 Jabez Snow died on 6 September 1760 in Eastham, Massachusetts[1,4,7,10], and was buried in Cove Burying Ground in Eastham. "In the Name of God Amen I Jabez Snow of Eastham in the County of Barnstable in the Province of the Massachusetts Bay in New England yeoman being Arrived to Declining Age but through Gods Goodness yet of Disposing Mind and memory Do therefore Now make this my Last Will and Testament in Manner and form as follows that is to Say first of all I Commit my Soul to God that Gave it and my body to the Earth to be Decently Buried. Item I Give unto my Dear and Loving wife Elisabeth Snow one third part of all my Personal Estate forever that is to say after my Just Debts is paid out of the whole of my Estate both Personal and Real also I give to my said Loving Wife the use and Improvement of one third of all my Real Estate During the Terme She Shall Continue to be my Widdow or till Death shall call her hence. "Item I Give to my three Sons and three Daughters after my Just Debts & funeral Charges are Paid all my Estate both Personal and Real Equally to be Divided Between them that is to Jabez Snow to Joshua Snow and Edward Snow to Eunice Horting Elisabeth Snow and Hannah Snow but inasmuch as Eunice Horting ^has^ had Given to her already to the value of eight Pounds Lawfull Money in my Judgment it is my Will & Desire that the other five Namely Jabez Snow Joshua Snow Edward Snow Elisabeth Snow and Hannah Snow Should have Each of them the Sum of Eight Pounds Lawfull Money first to make them Equal with Eunice Horting if ther Should be so much left after all debts and Charges is Paid & if any Remains then to be Equally Divided as above between Them all. "Lastly I Do Constitute and appoint my Trusty Son Jabez Snow to be my Sole Executor of this my last will and Testament Declaring this and no other to be my last will. In Witness whereof I Do here-unto Set my hand and seal this thirty first day of July in the Year of our Lord one Thousand Seven Hund and Sixty. "Barnstable SS By the Hom. Silvanus Bourn Esq'r Judge of Prob. Jabez Snow Executor Presented the foregoing and made Oath that it Contains a True and Perfect Inventory of the Estate of Cap't Jabez Snow late of Eastham deceased so far as hath Come to his Hands and knowledge and if more hereafter Appear he will Cause it to be added. The Subscribing Apprisers have Sworn as the law directs. May 9 1761 Exam'd Da'd Graham Reg'r"
3) Edward Knowles, Nathaniel Atwood and Samuel Smith were appointed to make a division of the widow's dower thirds of the real estate by the Probate Court Judge on 3 July 1761, and ordered on 17 September 1761. The third part of the real estate included a portion of the orchard; the great room, bedroom and buttery in the house, with a privilege to bake in the oven; the meadow in the Great Meadow below the mill; the wood lot; and one half of the pew in the meeting house. On 30 October 1761, the account of the debts owed against the estate of Jabez Snow was submitted to the Court, which amounted to £280 0s 4d. The executor charged himself with the personal estate, sold additional personal estate items, sold ttwo thirds of the real estate at vendue (£183 15s 2d), all of which created a total at hand f £282 5s 6d. He requested payment of funeral, doctor, court, payments, and other charges of £69 18s 7d. The net estate remaining was £212 6s 11d. The debts owed were £280 0s 4d. The Court ordered that the creditors be paid 15 shillings and 2 pence on the pound by the executor. The debt list, account and charges were approved by the Court on 5 January 1762 . 4) Willard Knowles was appointed administrator of the widow Elizabeth Snow's estate in 1772, and he sold the remainder of Jabez Snow's land (the widow's third) at vendue with a value of £97 15s 10d. He requested payments and charges of £9 2s 6d be paid, leaving a balance of £88 13s 4d. The Probate court Judge ordered that the creditors be paid 6 shillings and 4 pence on the pound by the administrator. The order was recorded 9 March 1773. 1. John Harvey Treat, The Treat Family: A Genealogy of Trott, Tratt, and Treat; for Fifteen Generations, and Four Hundred and Fifty Years in England and America (Salem, Mass. : The Salem Press, 1893)., page 215, Jabez Snow sketch. 2. "Massachusetts, Town and Vital Records, 1620-1988," digital images, Ancestry.com (http://www.ancestry.com), "Orleans and Eastham Records," Page 326 (image 172 of 285), Jabez Snow birth entry. 3. Col. Leonard H. Smith, Jr. and Norma H. Smith, Vital Records of the Towns of Eastham and Orleans (Baltimore, Md. : Genealogical Publishing Company, 1993), page 29, Jabez Snow birth entry. 4. John D. Austin, Mayflower Families Through Five Generations: Volume Six: Stephen Hopkins (Plymouth, Mass. : General Society of Mayflower Descendants, 2001, 3rd Edition), page 184, Elizabeth Paine sketch. 5. 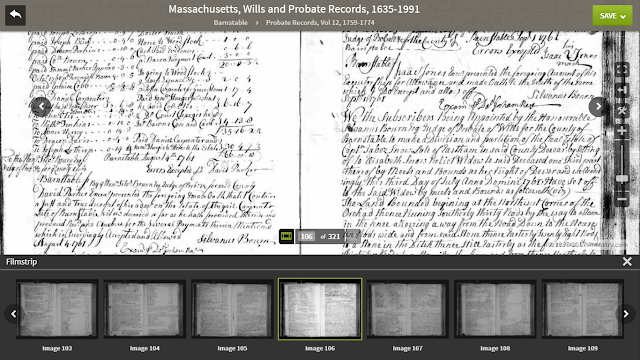 "Massachusetts, Town Clerk, Vital and Town Records, 1626-2001," database with digital images, FamilySearch (http://familysearch.org :, Barnstable County, Eastham, Orleans, "Births, Marriages, Deaths, 1701-1796," page 36 (image 26 of 126), Jabez Snow and Elizabeth Paine marriage entry. 6. Col. Leonard H. Smith, Jr. and Norma H. Smith, Vital Records of the Towns of Eastham and Orleans, page 66, Jabez Snow Jr. and Elizabeth Paine marriage entry. 7. Col. Leonard H. Smith, Jr. and Norma H. Smith, Vital Records of the Towns of Eastham and Orleans, page 66, Deacon Jabez Snow death entry. 8. Jim Tipton, indexed database, Find A Grave (http://www.findagrave.com), Cove Burying Ground, Eastham, Mass., Deacon Jabez Snow, Jr. memorial # 74075200. 9. 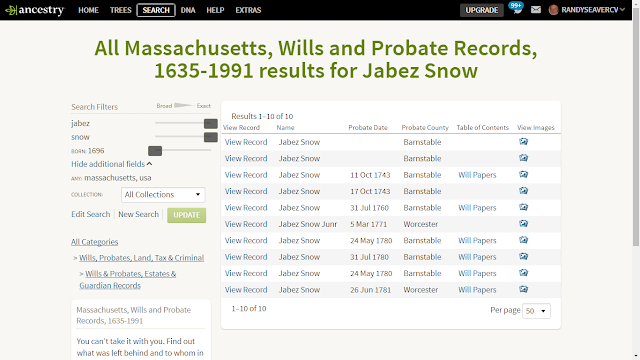 "Massachusetts, Wills and Probate Records, 1635-1991," indexed database with digital images, Ancestry.com (http://www.ancestry.com, Barnstable County, Probate Records, Volume 12, 1759-1774, pages 151-153, Jabez Snow, 1760 will and inventory. 10. Massachusetts, "Wills and Probate Records, 1635-1991," indexed database with digital images, Ancestry.com (http://www.ancestry.com), accessed 6 December 2016), Barnstable County > Probate Records, Vol. 8, 1745-1753, pages 457-458 (image 256 of 309), 1743 will of Jabez Snow and 1750 letter testamentary. Original data from Barnstable County [Mass.] Probate Court clerk books. 11. 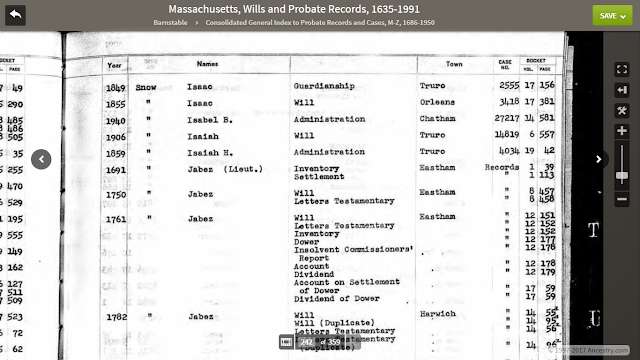 "Massachusetts, Town Clerk, Vital and Town Records, 1626-2001," FamilySearch , Barnstable County, Eastham, Orleans, "Births, Marriages, Deaths, 1701-1796," page 36 (image 26 of 126), Deacon Jabez Snow death entry. 12. "Massachusetts, Wills and Probate Records, 1635-1991," indexed database with digital images, Ancestry.com (http://www.ancestry.com, Barnstable County, Probate Records, Volume 12, 1759-1774, pages 177-179, Jabez Snow, 1762 dower set off, insolvent report, account, and dividend. 13. 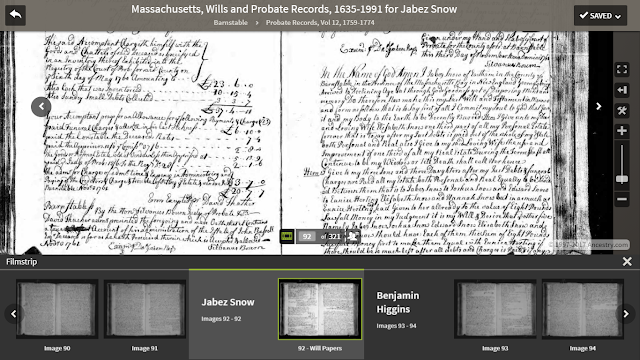 "Massachusetts, Wills and Probate Records, 1635-1991," indexed database with digital images, Ancestry.com (http://www.ancestry.com, Barnstable County, Probate Records, Volume 17, page 59, Jabez Snow, 1773 widow's dower settlement and dividend.